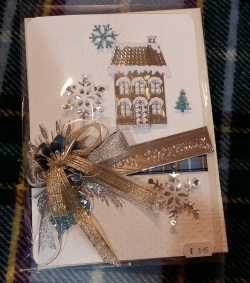 Carol Warton's truly spectacular Christmas Greetings! Christmas greeting cards simply do not come more stunning than those Carol Warton has hand-made for exclusive sale at MostlyManx this festive season. Boasting Manx embellishments, all perfectly crafted onto the highest quality card, and finished in a presentation box, we guarantee these cards will be a treasure for their recipient and a wonderful keepsake for years to come. Priced at £8.95, the finest details have been added to ensure each card is a “one off” and numbers available are limited, making them truly special. But don’t take our word for it…pop into the MostlyManx shop in Nelson Street, Douglas to see for yourself, or enjoy our beautiful display of Carol’s work in the window.